Home | Common Aquarium Questions | Visit the new and improved Aquatic Article Archive on ThatPetPlace.com! 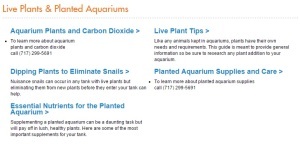 This section has basic aquarium information for many different types of aquariums. You’ll also find information on some of the basic principles of aquarium-keeping like stocking guidelines, water testing, the Nitrogen Cycle and more. This is a good place to start with basic questions on how to set up a new aquarium or before venturing into a new aspect of the hobby. Important steps when adding new animals to your tank – Acclimation Procedures and Quarantine Tanks – are also explained here. 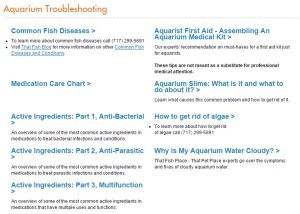 The Aquarium Troubleshooting section is a go-to location for all issues and problems that an aquarist might face. 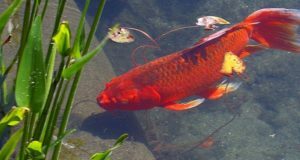 This includes an overview on Common Fish Diseases, a quick reference chart of Aquarium Medications and the more comprehensive overviews on Active Ingredients in medications from this blog. 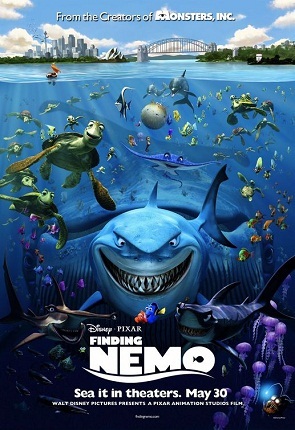 It also includes other articles about common aquarium problems. 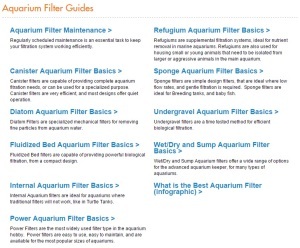 This section includes basics on all different kinds of filtration that an aquarists has to choose from. Visit here to get more information on each kind of filter to help you determine which is best for your tank and the best way to maintain the filter and media you choose. Like aquarium filters, choosing aquarium lighting can be a daunting task. The Aquarium Lighting Guides section has Aquarium Lighting Charts to help you choose the best fixture for a Freshwater Fish-Only Tank, Freshwater Planted Tank, Saltwater Fish-Only Tank or a Saltwater Reef Tank. It also includes information on each types of lighting available. Equipment other than lighting and filters are included in this section. This includes, air pumps, chillers, heater, salt mix and protein skimmers. 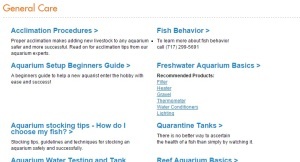 Our Compatibility Charts for aquarium livestock are all found in one place in the Compatiblity Charts section. These charts can help you make educated decisions on what livestock can go together in your tank. Separate charts can be found here for Marine Animals and for Freshwater & Brackish Fish. Our much-requested African Cichlid Compatibility Chart is located here as well. All things planted are included here. These articles include basics tips for live plants, supplies you’ll need for your planted tank, the most important nutrients for live plants and using Carbon Dioxide for plant health. Our popular blog on Dipping Plants to Eliminate Snails is found here too. 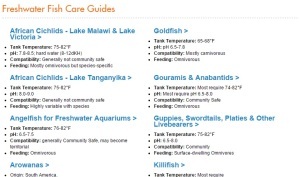 This section includes over twenty care guides for many different groups of freshwater fish common in the aquarium hobby. All of these care guides were written by our marine biologist and aquatic science staff and have been popular handouts in our retail store at the Fish Room Education Center. Over two dozen of our popular Saltwater Fish Care Guides are found here. Like our Freshwater Fish Care Guides, these were all written by our experts and are part of the Education Center in our retail store Fish Room. 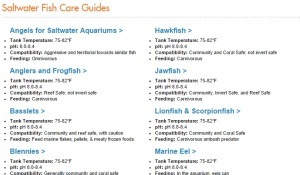 These care guides are a good place to start for basic information on lots of groups of fish, including care, feeding, compatibility, water parameters and behavioral information. This section is the home of the care guides available for many different saltwater invertebrates, including some corals. 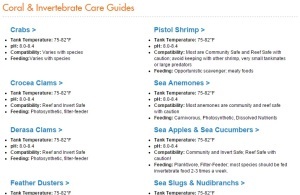 These care guides include specialty inverts like Mantis Shrimp and Pistol Shrimp as well as reef animals like Maxima, Squamosa, Derasa and Crocea Clams. Are there any other articles you’d like to see here on our blog or in our Aquatic Article Archive? Let us know what you’d like to see and we’ll do our best to cover any topics you’d like to learn more about!